Sometimes, the universe smiles on us and we get two Pixar films in a single year. We were pretty big fans of the year’s first offering, Inside Out, but will The Good Dinosaur stand up to its predecessor’s hype? The Good Dinosaur seems to be premised on the idea that the Chicxulub impactor, the asteroid that hit what’s now Mexico and is believed to have kicked off the end-Cretaceous dinosaur extinction, kind of… missed. An asteroid flew toward Earth and overshot it by a bit, and the dinosaurs went on chewing their dinosaur cud (or, you know, other dinosaurs). Because of this, the dinosaurs continued to grow and flourish—right alongside humankind. 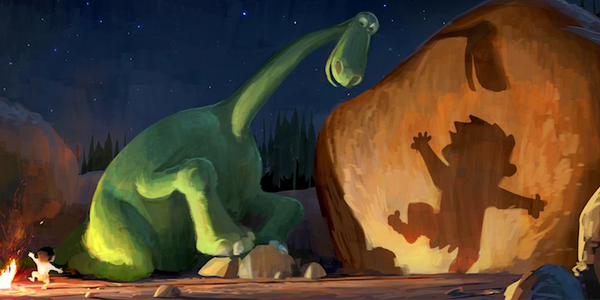 The story of the movie follows a boy who befriends a young dinosaur and their adventures together. And because it looks like the only speaking character in the movie is the little boy, we’re in for a mostly visual experience à la Wall-E. This does kind of worry me—if the boy is the only human character around, and the dinosaur is coded as male as well, then it means that there will be no female characters at all in the film. This is a kind of crappy step backward from Inside Out, and also unfair to Riley, IO’s protagonist. When the movie is about a girl, there apparently has to be a number of male subcharacters or boys won’t see it and it won’t sell. She has to share the limelight, while a movie about a boy character is not deemed to have a similar curse. It can focus on the boy and his dog dinosaur to the exclusion of all other characters and genders and that isn’t considered a double standard. I only hope that the preceding short this time around isn’t as heteronormative as Lava was. The theme of this story is being pushed pretty hard in the marketing: the idea that one moment could change everything, so we should seize the opportunity to be nice to others when it’s given—you don’t know how that kindness could change someone else’s life. While this is certainly an important message to send to children, I’m mostly worried that it’s kind of bland. Inside Out gave us a groundbreaking way to visualize the inside of one’s mind as well as a toolkit to talk to children about mental health issues. While this movie looks cute, I wonder how much the story will resemble every boy-and-his-dog movie out there, just with a dinosaur pasted in over the dog. In the end, as much as I love both dinosaurs and Pixar movies, I’m not sure how excited I am to see this particular one. It’s not out for a few months yet, though, so maybe the next trailer will pique my interest a bit more. This entry was posted in Disney, movies, opinion, Pixar, Trailer Tuesdays and tagged disney pixar, Pixar, the good dinosaur by Lady Saika. Bookmark the permalink.